Last week (with my departure from Chiang Mai imminent) I made one last pilgrimage to my favourite temple in Chiang Mai – Wat Umong. Set in the jungle, nestled at the foot of Doi Suthep mountain a couple of kilometres to the West of Chiang Mai’s old city, it has a certain air of mystery about it that is absent from Chiang Mai’s other temples. Underneath the grass area housing the main Chedi, are a set of tunnels which give the Wat its name. Legend has it that a king built the brick-lined tunnels for a clairvoyant but sometimes eccentric monk named Thera Jan; paintings dating back to about 1380 can still be seen decorating the walls, and if you’re female and really lucky you may find yourself cornered by a rather ‘excitable’ monk. Tina was. 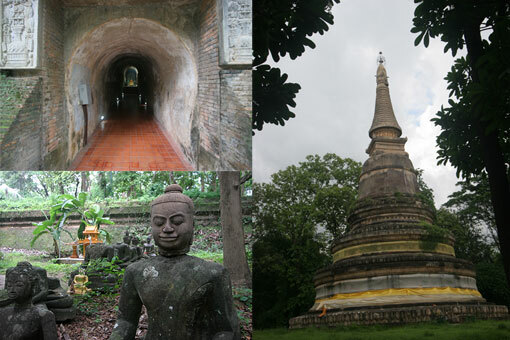 Close to the temples is a curious collection of Buddha heads and other relics from various temples in Thailand. This odd collection started when one of the temple’s supporters rescued some broken images from an abandoned temple in a nearby province and bought them here. Now, apparently, when people run across such relics or have a broken Buddha they want to replace, they bring them here. Informal Dhamma discussions are held at Wat Umong on Mondays, Wednesdays and Fridays between 1pm and 3pm, and on Sundays between 3pm-5pm. How much does it cost to practice? Is there a posibility to ordain a monk? Ich würde gerne Anfang April 2014 vorbeikommen und wenn es möglich wäre die Grundlagen der Meditation kennen zu lernen.